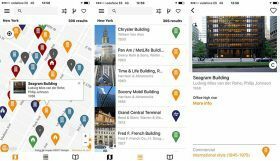 Because you can never have too many ways to explore a city, a new architecture-based travel guide map app helps make sure you don’t miss any important architecture (h/t Curbed). Made by architectural historians, ArchiMaps points out a selection of important works like buildings and bridges. It’s currently available for Android and iOS and in four cities–New York City, Chicago, London, and Madrid–so far with more in the works including Los Angeles, Berlin and Barcelona.